1. How do I become a volunteer? By filling and sending our Partners Form which you can find here on our website. 2. What do I do if I know someone who is jigger infested and they have not received any help? 3. When will you visit our area (giving a location)? Visit the calendar of events on our website. It gives the loactions and details of cour countrywide events. 4. Where is the main office located? 5. Do you partner with other organizations? Yes, we do. Kindly send an email to admin@jigger-ahadi.org or call +254 20 2020881for more information. 6. Does Potassium Permanganate (which we have seen you use in the treatment of jigger infestation) have any negative health effects on human body if you come into contact with it? No, it only dries the feet and hence the reasons for applying petroleum jelly on the feet. 7. Where did jiggers come from? There has been different theories about the origin of jiggers in Kenya. But according to some elderly people, jiggers were brought into the country by colonialists, as a biological warfare, to immobilise freedom fighters. They are said to have been fed on substances that cause mental retardation for human beings. 8.Is Central province the only place in Kenya where jiggers are found? NO. Jiggers are found in most parts of the Kenya. As a matter of fact, they are also found in other African countries, including Uganda and Tanzania. 9. Do jiggers affect any other parts of the body apart from the legs? YES. Jiggers are known to attack many other parts of the body, including the hands and knees. In our quest to fight jiggers and help the afflicted, Ahadi Kenya Trust has encountered people who have jiggers all over their bodies, including the head. 10. Is there a jigger awareness day in Kenya? NO. Ahadi Kenya Trust is however pushing the government to create one. 11. Why do people suffering from jiggers infestation seem retarded? 12.How do jiggers spread HIV Aids? positive person to remove jiggers. YES. So far, there are over 265 reported cases of deaths caused by jiggers, across the country. Seeing that many cases also go unreported, the number could be higher. 14. Is there medication for jiggers? There is no known medication to treat jiggers. When Ahadi Kenya Trust started eradicating jiggers, we were advised to use disinfectants like savlon or dettol, and found that it works. We have also been using a potassium permanganate solution, which is also quite helpful. That said, we are still researching for a medication that can completely eradicate jiggers. 15. Are jiggers treated in hospital? YES. Though most hospitals had earlier on refused to take on jigger infested people as medical cases, Ahadi Kenya Trust has fought to ensure that jigger infested people receive medical treatment and care like all other patients in hospital. 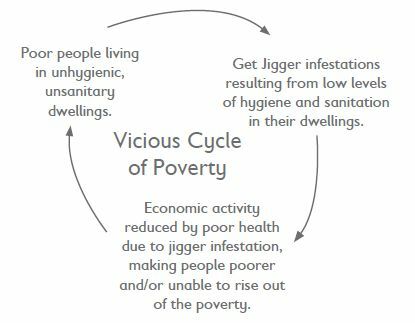 The biggest cause of jigger infestation is poverty, and lack of proper hygiene. People who do not keep their living homes clean, do not take a bath every day, and also share their living quarters with animals, especially poultry, are at a higher risk of being attacked by jiggers. 17. Does one get back to normal after the jiggers have been removed? YES. With proper treatment and care, one can go back to normal after jigger infestation. We have seen people who were once heavily infested getting back to productive life. 18. What is the Ministry of Public Health doing about eliminating jiggers? The Ministry of Public Health has been very supportive of the anti-jigger initiative. So far, it has mobilised health officers to fumigate the homes of the infested. It has also carried out training for public health social workers in most districts. Some money has also been set aside to facilitate jigger eradication. NO. Although one has to observe proper hygiene to prevent jigger infestation. 20. How many Kenyans are infested with jiggers? So far, there are over 2.6 million jigger infested Kenyans registered by Ahadi Kenya Trust. The number may be bigger, as Ahadi Kenya Trust has not been able to carry out a comprehensive behaviour study. The government recently put the figure for those at risk of jigger infestation at 10 million. 21. How did you start the anti-jigger campaign? The anti-jigger campaign started after we encountered some families with severe jigger infestation in Murang'a. In an effort to help them, we discovered the problem was bigger than we thought, as there were children who were missing out on school due to the menace. The fact that there had also been some cases of HIV transmissions in the victims during the jigger removal process really gave us a wake-up call, and sprang us into action. 22. What can I do to help eradicate jiggers?